This is my first post since changing blogging platform – how do you like the new look? I think it’s quite an improvement, though there’s still more work to be done on it. You know how sometimes you buy a fabric that you really like, but then it lives in your stash for years? That has happened to me more often than I‘d like to confess. When I first moved away from home I bought five metres each of cotton twills in pink, blue and sand colour. I made a dress and matching headband from part of the pink after a few years, and now I have used the rest of it to make a skirt. The blue and sand coloured material are still waiting for their moment to arrive. We were going to a wedding last summer, and being pregnant at the time, I had nothing pretty to wear. 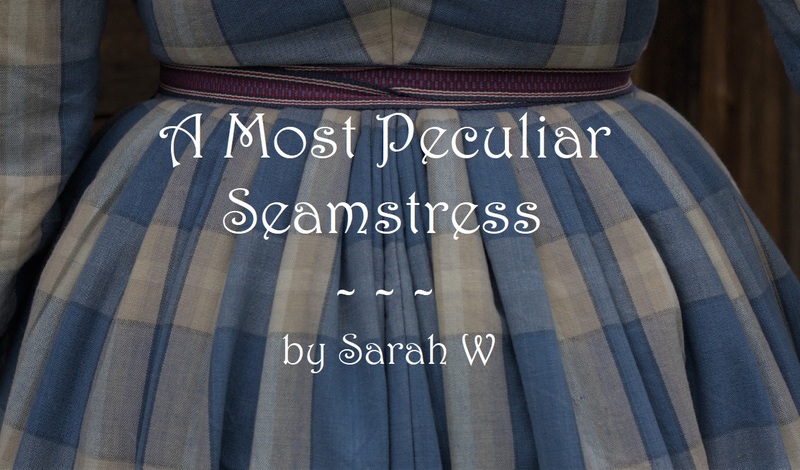 I made a typical “Sarah skirt”: straight panels pleated to a waistband, but where I usually have a buttoned closure in the left side seam, and a pocket in the right tone, I made plackets and pockets in both sides. That way the skirt was easily adjustable for pregnancy as well as the return of a waist after the arrival of Baby. Now, a few months after the birth of my third baby, I finally moved the buckles to make the waistband fit my current waist measurement, and got around to taking pictures of the skirt. It’s pretty long, as I prefer to wear long skirts, and has a decorative tuck close to the hem. The plackets close with buckles from my stash instead of the usual buttons, as I wanted something different. I made the pockets differently than I usually do too, set into the skirt panels, instead of just being a deep pouch set in a seam. While the dress I once made from this fabric is long gone, I still have the headband, and I like that it matches the skirt. I wore this outfit the other day, and when picking up my eldest from school, I overheard a few girls, aged six and seven, commenting on who’s mum I was, and that I looked “sooo nice”, with exclamation marks. Maybe I shouldn’t care so much about looks, but I confess the approval of these girls almost felt like the best anyone could wish for regarding appearance. I mean, if, as a tired mother in your mid-thirties, girls that age like your style, you’re basically up there with the Disney Princesses, and one could do worse.